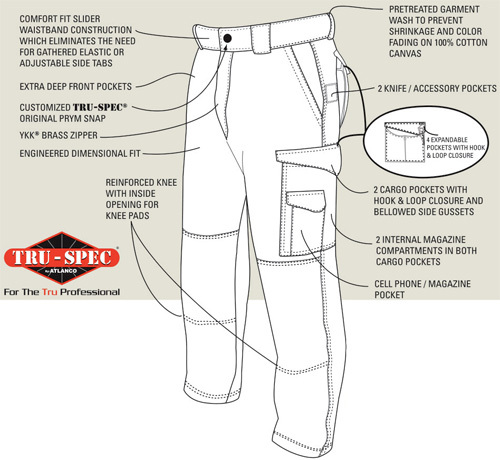 On Scene: Tru-Spec 24-7 Series Tactical Pants Deal! Tru-Spec 24-7 Series Tactical Pants Deal! The TRU-SPec 24-7 Series Tactical pants aren't just any old tactical pants, we assure you! And this week we're bringing them to you for a special deal, so snag yourself 1 pair for 15% off, 2 pairs for 20% off, or 3 pairs for 25% off. Why do we love these pants so much? Because they're durable with superior wearability and made fully for function (and comfort!). They're made from a tough, all-season poly-cotton Ripstop fabric, and with the addition of the Comfort Fit Slider Waistband they can accomodate a paddle or ITP holsters without adjustable side tabs! The deep and plentiful pockets are designed for secure storage of professional and personal gear, ensuring you'll never lose your belongings. We also love that these pants look sharp while you're on duty or off. You can enjoy them as a completely casual look, but then wear them on the job, too. The Tru-Spec 24-7 Series pants are based on the tactical uniform trousers preferred by many SWAT officers and special operators. Available in black, khaki and navy, you absolutely cannot go wrong with these pants. Shop Tru-Spec 24-7 Series Tactical Pants, today! Awesome information on tactical pants which are so designed to give you perfect stylized wearing experience.EMS pants & EMT pants are tough enough to withstand the unknowns in this field. Great pair of pants! I highly recommend them to anyone looking for a good pair of tactical pants.